Eddie Constantine (29 October, 1917 – 25 February, 1993) was an iconic American born singer and actor who became famous in France playing the no-nonsense, hard-hitting private detective Lemmy Caution, in a series of popular B movies. 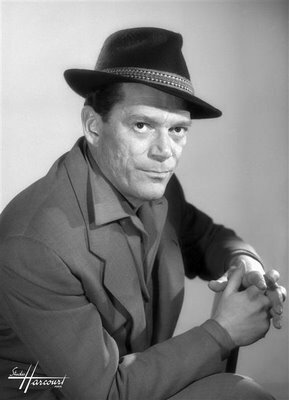 He reprised the character for Jean-Luc Godard’s New Wave Sci-Fi classic Alphaville (1965), the film for which he is now best remembered. When his box-office appeal waned in the late 1960s, he relocated to Germany, where he worked as a character actor in TV dramas and films that included Rainer Werner Fassbinder’s Beware of a Holy Whore (1971), later returning to work with Godard again on Allemagne 90 neuf zero (1991).